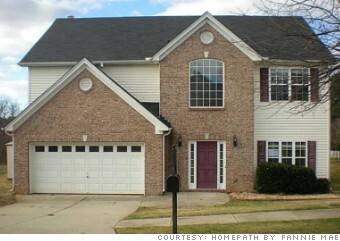 Repossessed homes are selling at bargain prices in these hardest-hit zip codes for foreclosures. It's a dubious distinction: Zip code 30045 in Lawrenceville, Ga., has the highest foreclosure rate of any neighborhood in the nation. A whopping 12.7% of its 11,232 housing units were hit with a notice of default, auction notice, bank repossession or other filing in 2012. With home prices here now about 40% below their bubble-market highs, many homeowners owe more on their mortgages than their houses are worth. Meanwhile, the recession hit the local economy hard, with unemployment among the worst in the Atlanta metro, said Cheri Buechler, a real estate agent in the area. That double-whammy has led many homeowners to slip behind on their payments. With all the defaults that have resulted, there are many bargains among homes repossessed by banks. This four-bedroom, three-bath brick and clapboard home that sold for $195,000 in 2006 is now back on the market for just $159,900.